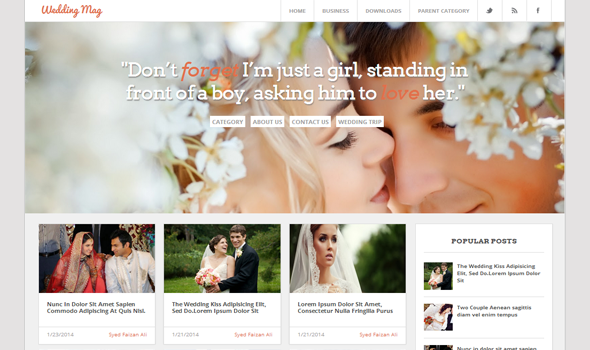 Wedding Magazine is a lovely marriage website blogger template ideal for wedding niche bloggers, but anyone can use it as a simple and elegant framework to shape it in any kind of website I.e. Technology, multimedia, entertainment and etc. This theme is Suitable for users who have zero programming or developing skills as well as advanced developers. This template comes with excessive features that are considered as the basic needs of a user and developer. It has some key features which we have defined below. Highly Responsive: This theme is 100% responsive and works with High definition monitors, Laptops, Tablets, Smartphones and the rest of the other devices. It automatically adjusts to the width of your site to the resolution of your devices. This makes it 100% responsive throughout all devices. Drop Down Menu: Just like our other themes, we have also added a high functioning drop-down menu to this template, providing a lot of flexibility to those who want to add a lot of categories and sub categories to their website. Featured Banner: At home, you can add a featured image banner to promote your latest posts or you can use it as a source of advertisement providing them extra space in your site to increase your revenue or affiliate commission. Clean and Elegant: The design of this theme is absolutely clean, elegant and efficient. This is the reason, why it would surely help those who don’t want a clean and pure design for their website. Some people are not too curious about advance features they just want things to be simple and modest. More Features: 2 column theme, 4 column Footer (Available for HD Laptops), Related posts, Threading commenting and much more. We hope this new simple and elegant responsive blogger template would turn out to be useful and effective for your brand. Do share your thoughts by leaving your suggestions below, lets have a nice and informative conversation ahead.